Welcome to Part Four of our Website Traffic Blueprint article series, where we explain how to turn a site into an automated web traffic generating machine using WordPress. In Part Two, we looked at the setup phase of the blueprint. We explained the best way to start if you don’t have a website yet, how to set things up if you already have a site, and what to do if your existing website was built with WordPress. In Part 3, we discuss the configuration phase. In this article, we will show you how to set up various WordPress plugins that can help bring traffic automatically to your website or blog. Depending on who you listen to, you could end up investing a couple of hours or more each day promoting your business on social media. Most businesses simply lack the time, resources and financial means to engage in the kind of content marketing that many marketing experts recommend doing. If you are spending half your day posting updates on Twitter, LinkedIn, or Facebook in addition to researching and writing content for your blog or website, how can anything in your business get done? Many business owners spend most of their time just keeping their businesses up and running. On top of this, there’s sales and marketing. After all, businesses need to stay competitive and make sales in order to survive. 43% of all small businesses surveyed spent around six hours each week on social media (most of the other businesses surveyed using social media spent even more time – between 6 and 21+ hours per week). This use of social media was a 66% increase from the previous year, so if the same research was done today, the numbers would most likely be significantly higher. More than half of all businesses surveyed spent 1-3 hours or more to create a blog post. Finding and posting content for social media was their most time-consuming online activity. One other important thing to consider is that, in addition to spending time social media websites, you are investing all of your efforts into virtual real estate that you have no control over. You don’t own Facebook, Twitter, or StumbleUpon. These sites can make decisions that affect your business without first consulting you. Why invest so much effort and time building a business on someone else’s real estate? With WordPress (self-hosted), you can control your own real estate and publish your content automatically to other online accounts. Which of these marketing channels do you focus more of your time, efforts, and your budget on? Should you invest so much time and effort building a web presence on other people’s sites (e.g. Facebook, LinkedIn, Tumblr, etc.) while ignoring your own domain? What we’d like to share with you now, is a free, simple, and effective method for automating your traffic generation process with WordPress. Invest most of your time and efforts building your own asset and still benefit from other people’s marketing channels. Many automated traffic solutions tend to focus on black hat methods, such as manipulating search engine results. This is not what the focus of this article series is about. In fact, we strongly recommend staying away from all black hat sites, strategies, software, and anything designed to “game” or violate the policies and terms of service of services like Facebook, Google, YouTube, etc.. The purpose of this series of articles is to show you how to automate your content distribution so you can leverage your time and marketing efforts, and get additional exposure online from websites that your target audience frequents. As we’ve just seen in the previous section, many small businesses lack the time, resources and budget to engage in the kind of content marketing that many online experts advise. What you want to do, then, is be strategic with your limited time, budget, and resources. With WordPress, you can publish once, and automate your content distribution to all other marketing channels. Simple … first, set up your site as explained in Part 2. Then, expertly configure your site settings as explained in Part 3. Once all of this is in place, you then automate various processes using plugins. You can get your posts automatically distributed to sites like Facebook, Tumblr, Twitter, GooglePlus, LinkedIn and more as soon as you publish new content using a WordPress plugin like JetPack. Jetpack is a free WordPress plugin with many great functions. After configuring all of the account and plugin settings, your content is ready for distribution. The native WordPress commenting feature lets your visitors interact with your web site, post new comments, reply to other users and participate in discussions. You can enhance the WordPress default commenting feature with 3rd-party plugins like Disqus, IntenseDebate, LiveFyre, or CommentLuv that integrate with social media, helping to share and spread your content online. For example, a plugin like CommentLuv (Pro version) can help make your blog more attractive to commenters by offering them a wider choice of backlinks if they tweet, plus1, or like your post. This plugin will visit the site of the comment author while they type their comment and retrieve their last blog posts, which can be included with their comment when they click the submit button. Social Bookmarking Platforms: e.g. Deviantart, Folkd, Instapaper, Reddit, etc. Blogs: e.g. Blog.com, Rebel Mouse, WordPress.com, etc. Social Media Platforms: Google Plus, YouTube, etc. Image Sharing Platforms: e.g. Flickr, etc. Document Sharing: e.g. Docdroid, Sendspace, etc. The above are just some examples of the many plugins that WordPress makes available for automating and sharing the distribution of your content online. Once your website or blog and plugins have been set up and expertly configured, all you have to do then to begin attracting more traffic is post new content on a regular basis. Once you have expertly configured your WordPress site, the next step is to optimize the web-traffic generation process. This step is covered in the next section of our WordPress Traffic Automation System series. Welcome to Part Five of our Web Traffic Blueprint article series, where we explain how to drive new traffic automatically to your website using the WordPress CMS. In Part 2, we focused on the setup phase of the blueprint. 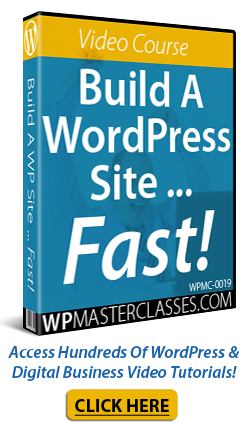 We helped you understand the best way to start if you don’t have a website yet, how to set everything up if you already have a website, and what to do if your existing website was built using WordPress. In Part Four, we discussed ways to automate traffic to your website with plugins. In this section of the WordPress web traffic automation blueprint series, we discuss ways to optimize the traffic-getting process using different tools and strategies. In addition to having an expertly configured WordPress website or blog, the key to generating consistent traffic of high quality is having a clearly-defined business vision, careful digital planning, and good systems and process in place. Let’s review the systems that will help you grow and manage all traffic. Marketing Systems – How you create new traffic for your business. Technical Systems – How you ensure that your digital presence remains operating efficiently for receiving traffic. Business Systems – How you manage and respond to traffic. What channels do you plan to use to drive traffic (e.g. blogging, PPC advertising, video marketing, etc)? What resources and portion of your budget will you apply to these marketing channels? How will you create and optimize your content, sales funnels, and run your marketing campaigns? How will you track conversions and measure the ROI of your marketing campaigns? During the setup and configuration phase, you should have installed an analytics program (e.g. Google Analytics). If you’re just starting out, you may want to consider investing in some paid advertising (e.g. Google AdWords) to help generate some intelligence. If you’re tracking your marketing campaigns correctly, this should yield some actionable data, such as the keyword phrases people are searching online to find your website, which you can use to create web content better targeted to your audience. Your technical systems ensure that your web presence remains up and running for receiving new traffic. There’s no point sending traffic to your site if your site is down or your pages are taking a long time to load. Your systems include handling technical areas like webhosting, website maintenance and support, installing and updating new software (e.g. plugins), customization, integration, troubleshooting, etc. Who is looking after my server? Who will look after my website and keep my site maintained and up-to-date? Who will fix errors, troubleshoot problems, provide technical support and advice, etc. if you experience difficulties? Many potential issues can be minimized if your website planning and setup and configuration phases have been completed correctly. As with all technology, however, you should expect to face problems. Your technical systems need to be robust enough to handle these. If you plan to outsource your digital marketing and technical services, then make sure you have implemented good systems to manage all outsourcing. With clear business objectives and great systems in place, all you need to focus your efforts on is growing a “traffic loop”. Step 1 of the process is to get your business exposed to as many traffic generation sites and channels as your time and resources will allow. An expertly configured WordPress site allows you to instantly share your content on social media accounts like Facebook, Twitter, Pinterest, etc. The easiest way to increase your reach and visibility online, therefore, is to simply publish more content on your site. As mentioned earlier, investing in some paid advertising (e.g. pay-per-click ads) can help you generate some initial data, which you can use to create content better targeted to your audience’s needs. Repurpose your content to leverage different media formats. Continue learning about ways to get visitors using methods like paid advertising, podcasts, joint ventures, etc. See earlier sections of this article series for a number of useful tools, plugins, and methods we’ve already covered to help you reach more potential users. Getting more content out there is great, but to make this activity more effective, your content needs to build authority and credibility with visitors. Publishing better quality content not only helps to establish your credibility, it also improves your chances of getting it shared on other sites and viewed by more people and hence more visitors. Create and publish content that will add value to users and showcase your expertise. This includes content that informs and educates readers, training content, user reviews, adding testimonials, etc. Consider publishing expert guides that can be sold or distributed online (e.g. sell on Clickbank. At some point, you may want to consider developing “traffic on tap.” You can do this by growing a list or starting an online membership site. With “Traffic On Demand,” your traffic comes from customers or subscribers – people who already like you and trust you. Your influence and credibility can be used to generate traffic with a single blog post or email. Encourage users to leave comments and start discussions on your site. Add an email newsletter and encourage people to subscribe. By taking advantage of incoming traffic to listen to what problems your users are trying to solve, you can have an endless funnel of ideas for developing new services, products, and solutions, all of which provide new opportunities for generating additional web traffic. Create a free or paid e-learning program. Publish a PDF guide that can be sold or distributed online (e.g. sell on Clickbank. Consider adding e-commerce to your business. The final step of the process is to collect and analyze data. By learning to interpret data gathered from existing traffic, you can discover new traffic opportunities. You should have already installed an analytics tool (e.g. Google Analytics) on your site. Make sure you understand the metrics and features and can interpret the data. Once you implement the above strategies, all you have to do is rinse and repeat, fine-tuning and refining your methods as you go to grow your traffic and get better your results. Hopefully, now you have a blueprint that will help you automate and optimize the process of driving visitors to your website and build a more successful business online. Welcome to Part 3 of our WordPress Website Traffic Blueprint article series, where we show you how to create an automated traffic generating machine using the WordPress CMS platform. In Part 2, we focused on the setup phase of the traffic automation process. We explained the best way to get started if you don’t have a website yet, how to set things up if you already have a site, and what to do if your site was built with WordPress. In this section, we will discuss the configuration stage of the WordPress traffic automation system. You will learn how to configure a WordPress site to get new visitors automatically when you post new content on your site. Being able to attract more visitors to one’s website is often cited by most business owners as their greatest challenge online. Businesses are becoming ever more competitive and are looking for any advantage they believe will increase their competitiveness online. Having the ability to generate traffic on demand is a huge advantage over the competition. For WordPress users, having an expertly configured website allows their business to get off with a flying start from the moment their site is launched. There is a difference between an expertly configured WordPress site and a website that has been professionally installed and set up by a web-building expert but not necessarily configured to its fullest advantage. With a WordPress site that has been expertly configured you get a professional web presence plus online business marketing automation! Not only does a whole lot more labor go into building and integrating an automated online business marketing system into your website, it also takes a special type of expertise. Let’s illustrate this with an amusing little story. Everything was going fine in the widget-making plant when things came to a sudden stop. As no one could figure out what happened, the manager decided to call in an expert to fix the problem. The expert arrived shortly afterward and, without saying a word, went immediately to the main control box. After staring silently at the circuit board for less than 5 minutes or so, the expert then took out a little hammer and made a gentle tap about 1 cm from the left corner of the unit. Immediately, the plant came back to life. The manager was grateful and relieved as he thanked the expert, who left just as quickly as he had arrived. A couple of days after resolving the incident, the factory manager received an invoice for the sum of $5,000. The manager called the expert, demanding to know why they were being charged such a ridiculously high fee for less than five minutes work and then requested an itemized invoice before hanging up. The main challenge most businesses face online is being able to consistently drive web traffic to their sites. How much money did the gizmo factory stand to lose when the machines ground to a halt and no one in the factory floor had the expertise to fix it? Did the expert in our story not have the right to demand fair compensation for years spent building up the knowledge, skills and expertise that allowed him to repair a very costly problem? Similarly, if you could have your WP website fully set up and configured so all you have to do is publish new content and search engines, social sites and dozens of other web properties would be immediately notified, how much time and money would you save? Although many experts often make difficult situations and problems look simple, it rarely is that simple or easy. Which plugins you need to install to add certain functionalities to your site. Which internal and external settings need to be configured to make sure things function to plan, etc. Although this part of the traffic automation system may not seem so technically difficult, it can be quite complicated. It’s not as easy as installing a plugin, clicking on a button or two … it’s all this and much more. Not all traffic is welcome traffic. Some of the web traffic your site will attract will be unwanted traffic like spam, malicious threats, brute-force bot attacks, etc. After checking your server settings and configuring these (if required), the next step is to set up and configure various external sites or online services. The purpose of adding external sites is that all content should be published from one central location (your WordPress site) and from there, it will automatically get syndicated to other parts of your web traffic generation system, or notify traffic-related web properties and applications. Once these external platforms have been added to your configuration, content linking back to your site will get automatically posted to these platforms, indexed by search engines and shared to other social networks, even to visitors attracted to the platform itself. Your site will be exposed to new sources of traffic and new audiences. Some web properties and online solutions will need to be set up before configuring your WordPress site’s settings to save time and some will need to be done later, during the automation phase. Google Search Console lets you inform Google about your site’s pages, submit XML sitemaps for automatic page indexing, and provides site owners with useful information, tools, and reports about their website. Once your Google Search Console account is set up, this information can be used with traffic-related settings in WordPress (e.g. using plugins like Yoast SEO) and other applications. Google Analytics lets you improve your site’s traffic performance, SEO, marketing campaigns, and more, by tracking all user engagement, pages visited, keywords searched for, social media referrers, etc. Once your Google Analytics account has been set up, traffic monitoring data can be integrated with WordPress using plugins and instantly fed to other useful applications. Bing Webmaster Tools is similar to Google Webmasters. Once your account has been set up, your information can be used to automate web traffic settings in WordPress (e.g. using plugins like Yoast SEO) and other applications. As discussed in Part Two, WordPress offers users a self-hosted and a hosted option. We recommended choosing the self-hosted WordPress option if you are planning to grow a professional online presence. WordPress.com (the hosted option), however, provides a number of useful tools, which various WordPress plugins can access. We recommend setting up an account with WordPress.com, therefore, and we’ll show you how to integrate this into your automated web traffic system in Part 4 of this article series. You will need to have already set up your various social accounts in order to configure these as part of your traffic generation system. After setting up and configuring everything, you will be able to syndicate your content automatically to your social media sites and drive new visitors to your site. Set up accounts with all of the big social networks – Facebook, Twitter, LinkedIn, YouTube, Pinterest, etc. There are lots of social sites you can set up accounts with. You don’t need to go crazy, just select those that will work well with your system and/or content sharing tools. Additional Solutions, Content Aggregators, Etc. There are many online web platforms and RSS aggregators that can serve as secondary sources of traffic. Some are free or provide free plans, and some are paid services. RebelMouse is a news aggregator for your social profiles and RSS feeds. Your content displays in a Pinterest-like format and users can follow your RebelMouse account. There are various technologies and third-party applications you can incorporate into your web traffic system. Please contact us if you would like to explore your options and discuss a strategy to suit your needs. After you have configured your server settings and set up accounts with external services, it’s time to configure your site’s settings. The first step in configuring your site for traffic is to ensure that your global settings have been set up correctly. Let’s go over some of the important points. Note: If you need help setting up the list of ping services on your site, we recommend using a professional web services provider. You can find professional WordPress service providers in our WordPress Services Directory. This section affects how visitors will see your content when they visit your home page and blog pages. The syndication settings in this section can influence traffic. For example, your choice of displaying the full text vs summaries of your post, affects how your content appears in RSS feeds and RSS email campaigns, and could affect someone’s decision to explore your site further, and whether or not they will visit your site to view the rest of the content from summaries, or read the content in full without the need to click through to your site. As far as your traffic system is concerned, however, the main setting in this section is whether the Search Engine Visibility check box is enabled or not. WordPress provides users with plugins that help to add just about every kind of functionality to your site, including traffic generation. Once again, it’s important to configure your site for handling both good traffic and bad traffic. Regardless of the type of business you run or plan to run online and how small you think your web presence is, web security is something you cannot afford to ignore. Security plugins like Blog Defender help to make your WordPress blog invisible to bot and hacker attacks. A plugin like Yoast SEO can significantly improve your SEO. Properly configured, this plugin not only makes your web pages easier for search engines like Google to index, it also gives you control over how your content is presented to Google’s search results and social media pages, e.g. Facebook, Twitter, and Google+. Allowing your visitors to share your content with their own networks can help drive more traffic to your site, especially if you publish content that adds value to readers. There are loads of social sharing plugins to choose from. Many social plugins let you choose which social sites your content can be shared to, embed social buttons into your content, set up default notifications, display/hide share counters (e.g. number of followers), etc. Some plugins even allow you to protect content or downloads which visitors can unlock by sharing your page. As well as configuring various plugins, many WordPress themes also include features that help grow your site’s traffic. Last but not least in the configuration process, are the areas that need to be set up outside of the global settings. Once again, when preparing your website for an increase in traffic, it’s important to plan not only how to handle good and bad traffic but also for all the situations that can seriously affect your business as more and more people begin to visit your website. If you engage in any form of business online (or plan to), it’s important that your site is compliant with legal requirements of government agencies that regulate online business practices. WordPress post categories and tags help search engines index your pages, which improves traffic. As we strongly recommend in this article, it’s best to set up your website’s tags and categories earlier on, during the Website Planning Stages. When considering ways to automate and improve web traffic, you will want to review and make sure that the post tags and post categories that have been set up. It’s important to note that an HTML site map and an XML sitemap are different things. Although search engines like Google can index your pages just from an XML sitemap (which plugins like Yoast SEO can provide – see earlier section), allowing visitors to find more pages on your site can result in increased traffic. 404 Page Not Found – Another Source Of Web Traffic! Although a 404 Not Found error page can be set up in your server, there are several WordPress plugins that let you easily configure your 404 page inside your WordPress admin. Once your website has been fully set up and expertly configured, all you need to do is publish web content consistently to automatically generate web traffic. The kind of skills and knowledge involved in expertly configuring a WordPress site typically takes many web developers a long time to acquire. Once you have expertly configured your WordPress site, the next step is to automate the aspects of the process that can be automated. This step is covered in the next article in our series. This tutorial is part of an article series designed to help small business owners learn how to grow their business online with a WordPress-driven website and proven marketing strategies that are easy to implement. Want To Get Automatically Notified When New WordPress Tutorials Are Published? Then Subscribe To WPCompendium.org!